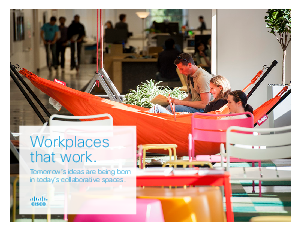 Home > White Papers > Cisco > Workplaces that work: Tomorrow’s Ideas are Being Born in Today’s Collaborative Spaces. Offices aren’t productivity factories anymore—they’re collaboration centers where individuals and groups can develop their best ideas. That means building out an office takes a whole new approach, and it isn’t just about using aesthetics and shiny toys to attract top talent (although that is part of it). Successful offices are functional tools that bring technology and people together so they can do their best work. Cisco® Collaboration tools bring people together to speed the decision-making process and help you execute on your most innovative ideas while cutting operational waste. Read this ebook to learn why bringing Cisco Collaboration to your workplace can create a workplace that works.